This article is about the neighborhood within the former Kingsessing Township. For the former Kingsessing Township, see Southwest Philadelphia. 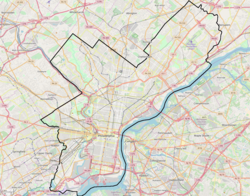 Kingsessing is a neighborhood in the Southwest section of Philadelphia, Pennsylvania, United States, located next to the neighborhoods of Cedar Park, Southwest Schuylkill, and Mount Moriah, as well as the borough of Yeadon in Delaware County. It is roughly bounded by Cobbs Creek and 60th Street to the southwest, Woodland Avenue to the southeast, 53rd Street to the northeast, and Baltimore Avenue to the northwest. The S. Weir Mitchell School was added to the National Register of Historic Places in 1986. The United States Postal Service operates the Kingsessing Post Office at 5311 Florence Avenue. Free Library of Philadelphia operates the Kingsessing Branch at 1201 South 51st Street, below Chester Avenue. ^ "Post Office Location - KINGSESSING." United States Postal Service. Retrieved on December 4, 2008. ^ "Kingsessing Branch." Free Library of Philadelphia. Retrieved on November 10, 2008. This page was last edited on 11 March 2018, at 12:31 (UTC).